LeBron James was vilified for "The Decision" when he announced he was taking his talents to South Beach. But when he decided to return to Cleveland, he decided to do things a bit differently, opting to pen a personal essay in Sports Illustrated that sparked his media company—Uninterrupted. In 2014, LeBron decided to leave Miami and return to Cleveland and the Cavs. This was obviously a massive moment both in LeBron’s career and NBA history. A lot went into it and a lot came out of it, so much so that I wrote a different book on the topic called Return of the King, available at fine retailers, should you want to know more about it. In all honesty, the basic idea wasn’t that different from The Decision. Instead of getting a TV network to hand over the reins, a major magazine and website allowed LeBron to take control. ESPN had been vilified for its role in allowing LeBron to do so in 2010; in 2014 Sports Illustrated was lauded. The difference was in the delivery. First off, the news came right out front, not 10 minutes in. 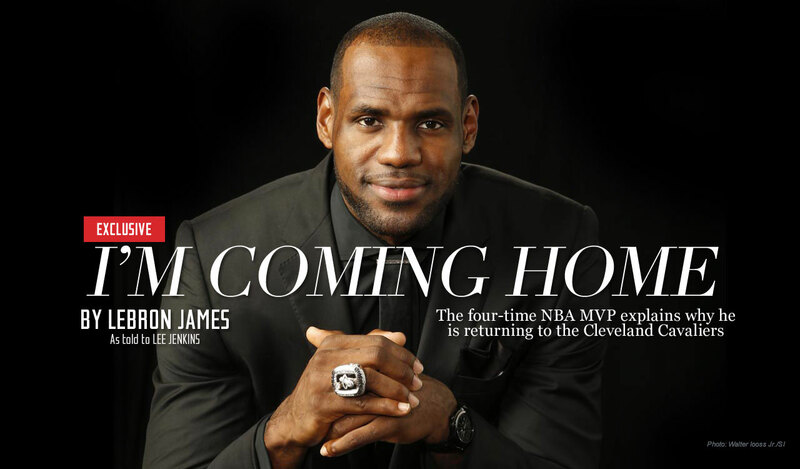 The graphic on Sports Illustrated read "I'm Coming Home." What followed was a flowing, personal, and nuanced explanation of LeBron’s choice to go back to Cleveland, buffeted with promises to take it slow and steady. There was no promise of seven championships, as LeBron had done in a flippant but later painful moment in the televised rally when he signed with Miami. With the help of a strong writer and the polish that rounds of editing allow, the end result was more pleasing in every way. It didn’t hurt that the story—prodigal son goes home to try to make good—was simply more attractive to the average fan than the last one: mercenary goes to form unbeatable team. It also must be said that LeBron’s résumé was quite different; he’d won two championships, and it provided him a certain amount of capital that his 2010 move just didn’t have. In 2010, the group said it hit them how badly The Decision had gone when they made the flight down to Miami from Connecticut late that night. The videos of the burning jerseys were out there, and the backlash on social media had started. By the time Heat president Pat Riley and coach Erik Spoelstra met them at the private jet terminal in Miami, LeBron and his associates were a little melancholy. Spoelstra had brought cookies to celebrate; they were looking for hard liquor. LeBron James has proven himself one of the greatest basketball players of all time, but how did he make the transformation from hoops star to sports and business mogul? James's journey down the path to becoming a billionaire sports icon has taught him lessons along the way. In 2014, they realized just how well it was going over on the flight after the letter came out. LeBron had made the announcement from Miami and signed the contract with the Cavs that evening before he took an overnight flight to Rio de Janeiro, where he was doing some Nike business around the World Cup Final. As the Nike Gulfstream jet headed south over the Caribbean and the high-end red wine was cracked open, the group started talking about the reaction and what it could teach them. Like with The Decision, it was really about athlete empowerment. LeBron had something he wanted to say, and by going directly to the fans he was able to create a connection that, this time at least, had paid off. Was this something that could be replicated? Lynn Merritt was on the flight. So was Mendelsohn. With Mendelsohn’s background in politics, creating a message and getting it out was a daily part of his job. LeBron’s letter in some way was like a political speech, an announcement followed by a platform. Mendelsohn, who was a partner in a public relations firm, was also keenly aware of the trends in media and the direction things were going. The use of digital media was growing rapidly, moving away from traditional outlets, especially for younger consumers. It was one of the reasons Mendelsohn wanted to use a digital outlet, Sports Illustrated’s website, instead of a traditional outlet, like ESPN TV, to make the announcement. One of the lines in the essay read: “I’m doing this essay because I want an opportunity to explain myself uninterrupted.” That was the basis for the concept, to present something without it having to be filtered or chopped up by media or reduced to a character limit by social media. To be uninterrupted. On the flight, the group came up with a plan to create a digital media platform that would allow athletes to do what LeBron had just done: deliver a message uninterrupted that would be easily shared via social media. If they could profit off these stories by selling them to brands or getting them sponsored, all the better. They decided to name it exactly that: Uninterrupted. They weren’t alone in having the idea. As Uninterrupted was developed over the coming moments, a similar concept was being assembled by Derek Jeter and his representation agency, Excel Sports Management. Less than a week after Jeter retired from the Yankees in the fall of 2014 after a brilliant career, he announced the formation of a website called the Players’ Tribune, which would be a place for athletes to publish personal essays just as LeBron had done with Sports Illustrated. Excel had a number of the world’s best athletes under its umbrella, a ready-made list of contributors. Within eighteen months the idea was backed by some athletes and investors as it raised $18 million in funding, including an investment from Kobe Bryant. Uninterrupted had a huge name in his prime, LeBron, and they had the vision of Carter and Mendelsohn to help foster ideas. But they also had a very valuable connector: yet again, Wachter. In addition to all his other connections and roles, Wachter had been on the Time Warner board of directors since 2010. One of the largest media companies in the world, it controlled a number of influential media brands including Warner Bros., Turner Sports, HBO, and Bleacher Report. As LeBron’s SpringHill and Uninterrupted ventures grew, it would largely be through strong connections and investments from these Time Warner entities stemming from relationships that were developed with guidance from Wachter. Carter recruited and signed a number of high-profile athletes and gave them ownership shares in the new platform, and they contributed video testimonials. Some of the initial partners were Rob Gronkowski of the New England Patriots, Draymond Green of the Golden State Warriors, and UFC fighter Ronda Rousey. The videos showed up on Bleacher Report through a deal negotiated with Turner Sports. The first ambitious project was a documentary series with LeBron and Green as they led up to playing against each other in the 2015 Finals. As all of this was unfolding, there was the third pole in this operation, which was LeBron’s acting work. He’d done some commercials and small work where he’d been the voice of characters. Plus there was that Saturday Night Live gig, but that was years in the past. The first major, legitimate role came in the comedy Trainwreck, which filmed in the summer of 2014. Comedian Amy Schumer wrote LeBron into the script mostly because he was the most famous basketball player she knew, not because she thought he’d actually take the role. But when actor Bill Hader was cast as the lead, the possibilities opened up because Hader had worked with LeBron at SNL. Hader and Judd Apatow, the director, showed LeBron the script and took him to lunch. LeBron and Carter didn’t love it at first. The script called for LeBron to have a relationship with Hader’s character, a doctor, because of a knee surgery. Carter didn’t want LeBron to be portrayed as an injured athlete in the movie; he’d never had knee surgery. Apatow and Schumer changed the script and made LeBron a best friend character to Hader. Amar’e Stoudemire, who did have a history of knee injuries, had no issues playing the injured athlete. LeBron had no history as a bankable movie star. Having him in a supporting role in the movie wasn’t a guarantee of selling tickets. Apatow could have just moved on to another basketball player willing to have scenes in a hospital gown. Carter and LeBron knew there was a power in saying no at first. Apatow, Schumer, and Hader were so motivated to work with LeBron, though, that they were willing to change numerous scenes to make it work. And Schumer and Hader set him up with some winning lines in the script. With that, LeBron was sold on the project, and he came to New York for a week of filming in the summer of 2014, shortly after he signed with the Cavs. They set up the shooting schedule so LeBron could film his scenes last. Again, it helps to be a very famous basketball player. And, apparently, to be selective and demanding in projects can pay off. Somewhere along the line, LeBron and Carter had learned these lessons. It didn’t always work, but it often did. When the movie came out in 2015, LeBron won critical and audience acclaim for the role. Apatow and Schumer had given him just the right amount of exposure in the film. There were some layup jokes without sounding corny or going overboard. In short, it was pitch perfect and the exact way to be introduced into movie acting, not too big or too small. It opened up a world of opportunities down the line. He was hardly the first major athlete to get into acting. From Jim Brown to Wilt Chamberlain to Shaquille O’Neal, many had come before him. But none of them had visions of doing it as part of the studio. Thanks to Wachter and Carter, that’s where LeBron was going to try to be different.